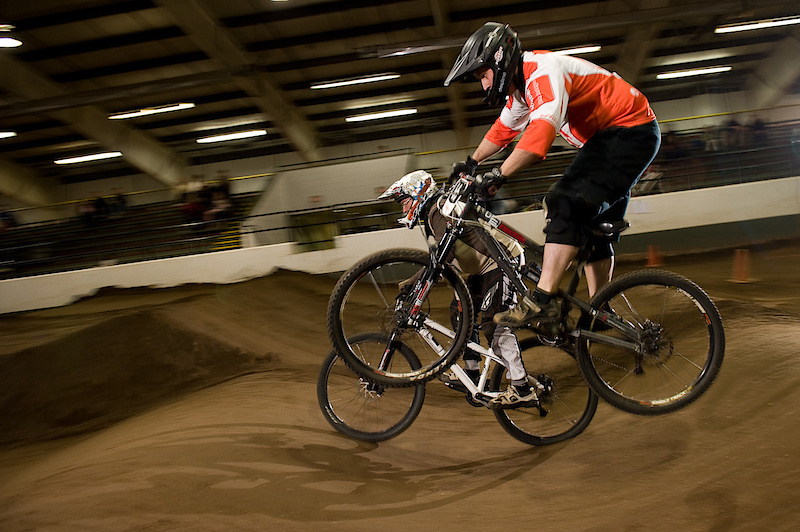 Jan 18th 2010 – Abbotsford BMX re-opened their doors after a 15 hour track build that introduced riders to a new flowy track filled with fun challenging jumps and a third straight decision-maker pro set that will test riders as the track hardens and riders speed up. 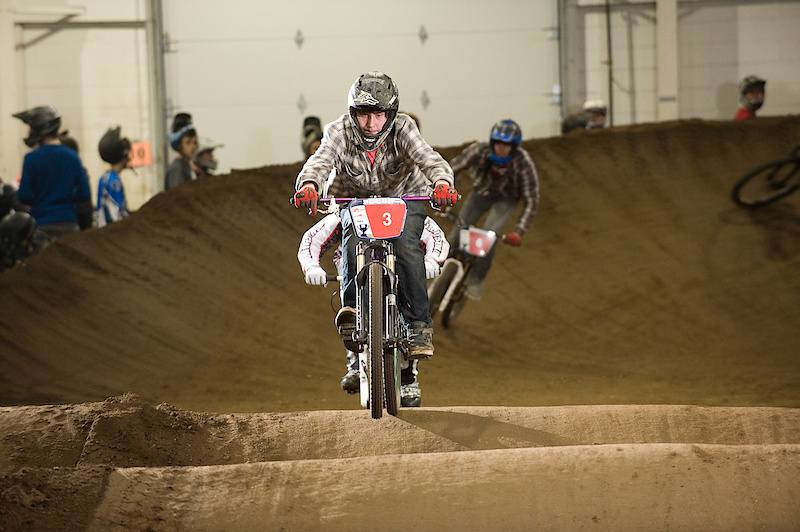 The 2010-2011 Rockabilly Racing Series is brought to you by Kona Bikes, Chromag, Smart Water, Clayton Racicot Photography and Abbotsford BMX. The doors opened at 4pm and riders got to it. By the time the rider meeting was called up, and motos were posted, riders in every class were dialing in the second straight and 3third straight rhythm section. No one had yet swung over to hit the new decision maker, but the night was young. 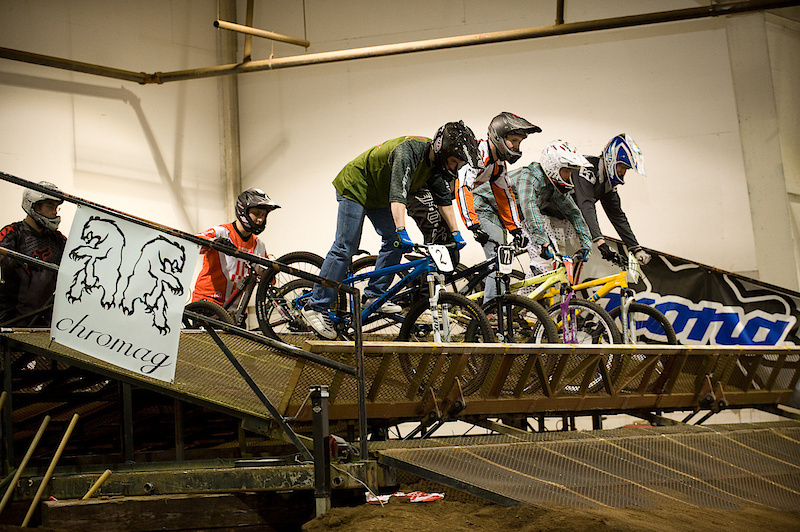 Clayton Racicot was there to snap all the pics and they’re up posted on his GALLERY! There were a couple class mash-ups Tuesday night. Pro Men, and Vet Pros ground it out while Pro Women, Open Women, and Junior women all made up a sweet 7 rider class. 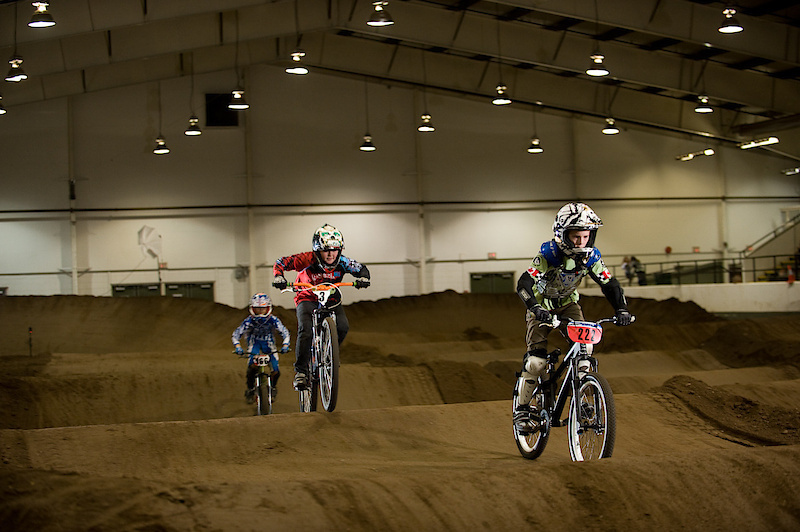 All points are still recorded in their respective classes, but larger race classes mean more racing, so the class mash-ups stoked up the riders and the crowd watching. In U13, Travis Reginer, Aidan MacDonald, and Michael Meade dooked it out over three rounds and traded spots on the leaderboard until Reginer slipped by MacDonald for the win on the night and took back the overall #1 spot by two points. It’s too close to call with only 3 races down on the series, MacDonald will be back next week to try to get his tops spot back. Another leaderboard swap happened in the U15 class, where Jesse Macleod came back from a socially awkward wrestling match during the rider meeting to take the number #1 spot for the night just ahead of Darien Landers. 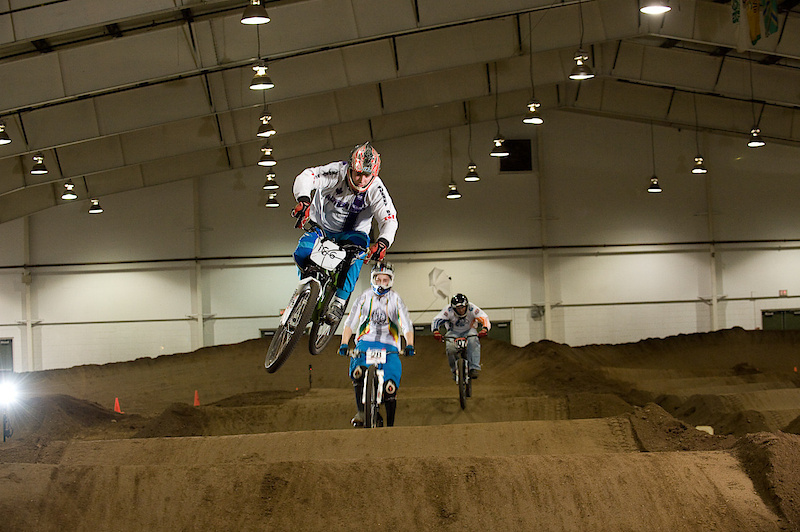 In Junior Men, It was all Kyle Murphy for the night as he extends his lead on the series. Carson Jordan, currently sitting in the #2 spot in the series takes second on the night ahead of Cole Swanson and Eric Wong. 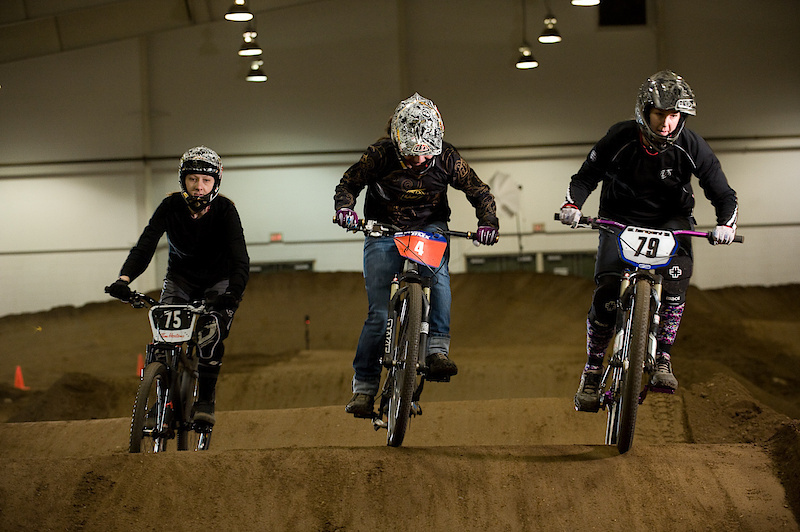 The Ladies were fresh off of their 4x Race Clinic and their laps showed. Jessica Weed went unchallenged in the Pro Women, While Paula Armstrong took the Open class ahead of Crystal Lambert and Beatrice Jakob. Only one point separates these three ladies on the leaderboard, and with three races to go, it’s anyone’s race series. 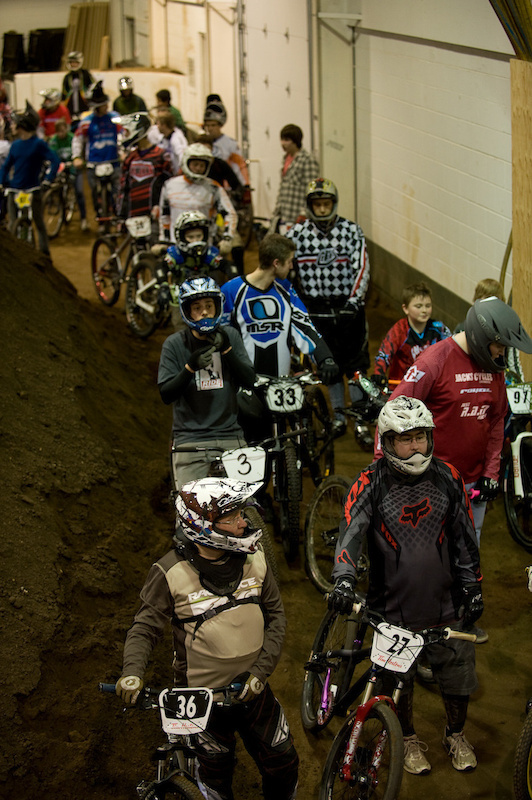 The Vet Open Mens class brought out the largest Vet class to date and it seems to keep growing. Andrew Ewart took the night ahead Abby’s Steve Baxter and 4x rookie Kim Knowles. As these old buzzards get more races under their belt, the Vet Open class will get tighter and way more fun. 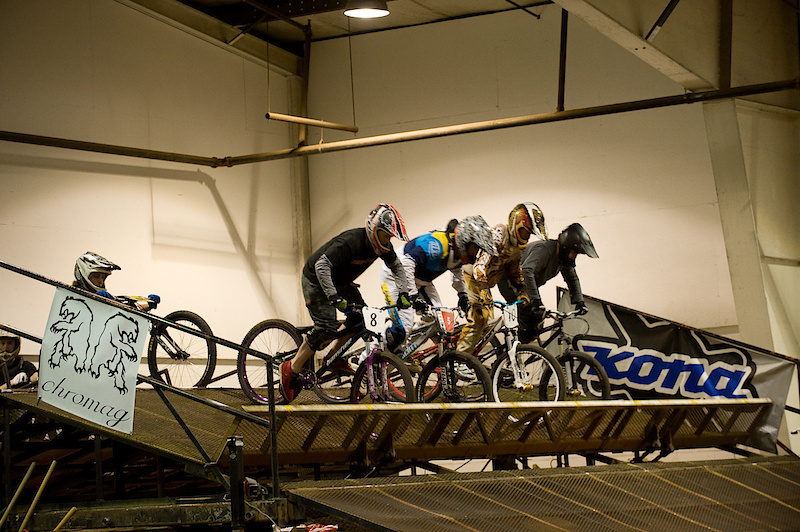 If you’re interested in coming out, check out one of the practice nights and see if you’re up to racing 4x indoors. 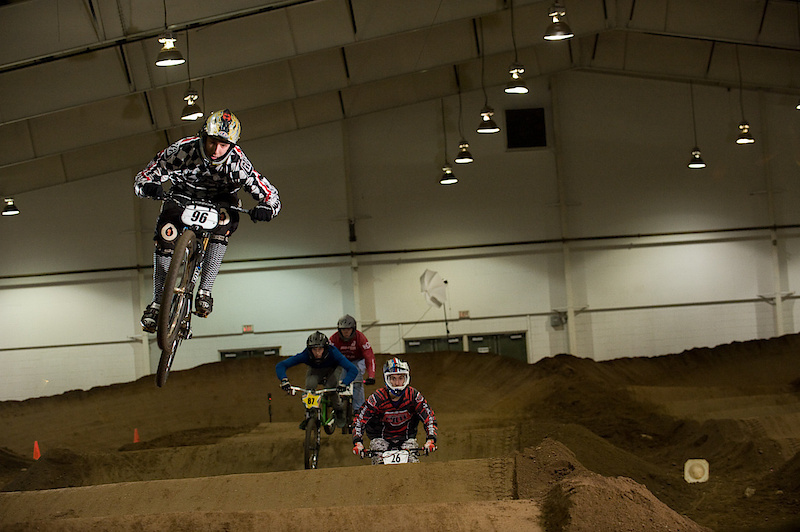 The Open Men’s Main event looked like they could tangle with the best of Lites and Pros as Tyler Shmyr took on Bob Jones, Devyn Pelley and Sean Best. Some smooth riding put Shmyr ahead of the pack as he took the #1 ahead of Jones. But Jones and Pelley have been climbing the leaderboard these last few races so keep your eyes on those riders to see how this all ends up after the Feb finals. In 4x Lites, Bart Brown and Jordan Timmer put on a clinic as they went #1 and #2 on the night ahead of RD Watters and Demo Dave McNaught. This class is getting faster and faster through each race. It’s sounding more and more like a Pro-Am Race might be in order! Brown holds his #1 spot with 4 points ahead of Timmer. Jordan will be digging deep to close in on the undefeated Brown, but with over a month of racing left, he just might reel the big guy in. Brown’s saying ‘yeah….no way’ right now. In the second mash-up for the night, Pro Men and Vet Pro Men tangled as the wiley vets did their best to get into the heads of the your pros. Lets face it. They bribed them, let air out of their tires, told them their pedals were on backwards, and openly judged their helmet choices. Anyone who raced previous years knows about how the pros would rib each other to psyche each other out, and guy who wrote the book on this was Adam Muys. Bad News has raced Brian Onofrichuk no less than 972 times yet still found a way to nudge him wide on the third straight into the new step-on-step-off decision maker. O-Show was the first to break in the new feature, and tailed Muys into the third turn. Both riders finally crossed the line laughing at the moto while both making the main event against Cam Murphy and Harold Woolnough. But Woolnough and Murph know better than to let these guys rock them, and even used their own tactics as Woolnough set up in the slow lane. As the gate dropped, Woolnough took off but could quite catch Murphy to the first turn. Harold shadowed Cam all the way thru the main to the finish with O-Show and Bad News Muys coming in third and fourth respectively. Cam Murphy extends his lead on the series by 6 points, while Harold holds steady at #2. Next Race? Next Week! See you Tuesday for #4 on the series!